All the buildings at Collins Old Towne were constructed on the site. Much of the material used was taken from old homes around Central that were being demolished or renovated. Buddy and Kathie Sims donated an old house on the mill village that was demolished. John Randolph provided windows, doors and beaded ceiling from an old mill house that is used in the schoolhouse. Much of the ceiling in the General Store came from the old Dillard Shoe Shop in Central. Other lumber used in construction of these buildings was taken from trees on the farm and sawed into lumber at the sawmill here at Ole Towne. Buildings were purposely designed and constructed to reflect the period being depicted. The General Store. The store is well stocked with memorabilia concerning early life in a small community as well as items from the town of Central. Collection includes merchandise bought by Roy and Pat Collins from throughout the United States as well as country store equipment of the 1820s through the mid 1950s. Barber Shop. The depression-era barbershop features a reconstructed motorized barber pole, coat rack and several other items that were used by the late W. C. Dobson in his barbershop in Central. 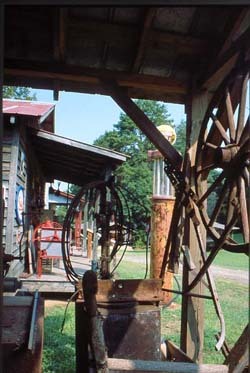 Joe Tankersley, the final owner, of this shop loaned several of the items on display. Roy and Pat Collins purchased the barber chair, pedestal lavatory and many other items of interest during their travels. 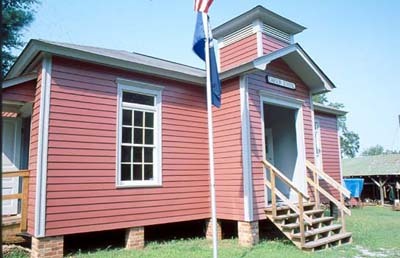 Schoolhouse. The latest addition to Ole Towne is the schoolhouse. It features a bell tower with a functioning bell. Just tug the rope and you get the feeling it’s school time again. Step inside and sit in one of the old desks some dating back to the early part of the century. Several of these were used at the Old Central School. John and Clara Head of Central donated these. Roy and Pat Collins purchased other desks in Louisiana, Mississippi, Alabama and Tennessee. Many old school books and other memorabilia can be found in shelves along the walls. A stage at the front of the room provides a platform for the children to perform. Oh yes, in cold weather the wood-burning heater will keep you cozy. Call for appointment. Admission charged.